Keeping an eye on the health of the marine milieu, and especially the coral reefs and their resident populations, is a priority for IFRECOR— French Initiative For Coral Reefs. With this in mind, an agreement between the Réserve Naturelle and IFRECOR, via the Regional Direction for the Environment, will lead to the development of indicators to track the health of the reef communities, as well as review the 2018 activities of the “reef network” in the French West Indies. Amandine Vaslet, PhD in marine biology, will lead these two projects. She recently evaluated the first management plan for the Réserve Naturelle, before creating the second. In order to lead these projects properly, the scientist will refer to the data from scientific studies on the reefs done by the Réserve in 2017 and 2018, as part of the reserve network’s Reef Check project. The analysis of this data will provide information about the extent to which hurricane Irma impacted the coral in Saint Martin. Vaslet’s report is expected in December 2018. Guillaume Montagne, an intern at the Réserve from April through August 2018, made an oral report on the results of his internship for his professors at the Université de Calais (ULCO), where he just got his degree in the management of property and personnel, natural hazards, and the management of urban spaces. In charge of the planning stages, conception, implantation of BIOHAB2, he followed the evolution of this artificial habitat located near the Remorqueur dive site, off the coast of de Tintamare. One month after the immersion of the structures, a dive afforded the observation that the number of individuals per species was well superior to that observed by BIOHAB1, which disappeared with hurricane Irma. The data is still being sorted, but Julien Chalifour suspects that this abundance is due, in part, to size of the new installation and in addition, the proximity to Remorqueur, a site already over-populated. Schools of young pigfish were seen here alongside young surgeonfish, butterfly fish, and angelfish, as well as young royal lobsters. A month later, a second dive revealed an augmentation of all these populations and the incorporation of new species as well. The first successes recorded for BIOHAB2 was broadcast by IoTV, a local channel, and will be showcased on Thalassa early next year, on a program dedicated to Saint Martin and climate change (see article page 6). On October 15-17, 2018 at the Overseas Ministry, Nicolas Maslach, director of the Réserve Naturelle de Saint-Martin, participated in the standing committee of IFRECOR—French Initiative For Coral Reefs. Site by site, studies conducted about the ocean floor in the French Overseas Territories were presented. This report preceded a session on strategies to follow, or establish, for the conservation of the reefs, plant beds, and mangroves in years to come. At the same time, various methods of working were proposed concerning development projects threatening these natural environments, and the method MERCI, to Avoid, Reduce, and Compensate, was born. In other words, in the short term, to avoid development, but if it has to take place, act to reduce the consequences on the marine milieu, and finally impose an obligation on the developer to compensate for the expected impact, by financing ecologically sound projects. A study on the evolution of regulations concerning these two species. More than 200,000 euros was allotted to the Réserve for the period 2018-2023. This budget will allow the Réserve to finance visits by specialists to create diagnostics and train the agents. A project manager will be recruited shortly: this post will be shared between the LIFE program and the AFB project for the preservation of sea turtles. (see article page 24). Organized every year since 2008, this year’s Reef Check took place on September 17-19, off the coast of Galion, Caye Verte, Pinel, and Rocher Créole. Two volunteers, Théo Feger and Guillaume —of Jorakhae Free Diving School — joined forces with the Réserve. The data is still being evaluated but, one year after hurricane Irma, observation revealed a high presence of green filamentous algae, especially on coral reefs and plant beds, but also washed up on the beaches, including Pinel. These algae are generally present in these areas, but usually on a seasonal basis and of a smaller quantity. Their abundance this year is an indication of organic coastal pollution, with water treatment stations at but 50% of their capacity, according to a press release issued by the EEASM in October 2018. The proliferation of these algae is promoted by strong rains, at which time runoff water is filled with organic materials and nutrients, and this year also from non-purified wastewater. Consequently, the soil leaching and coastal pollution enrich the shoreline milieu, which benefits the algae, but to the detriment of the coral that suffocates. 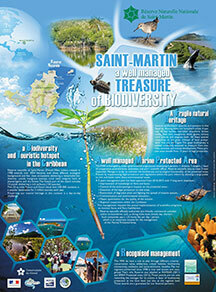 The degraded quality of the coastal waters represents the first cause of deterioration of the marine biodiversity in Saint Martin. 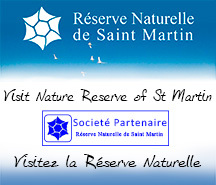 Since 2007, the Réserve Naturelle has continued its annual scientific study of the reefs and plant beds. This took place this year on September 24-26, with the support of Jonas Hochart, from Saint Barth’s Territorial Environmental Agency. He helped the team from Saint Martin in documenting the evolution and general state of the coral communities and plant beds on the three reef stations— Chico, Rocher Pélican, and Fish Pot, a site located outside of the Réserve —and the three plant bed stations — Rocher Créole, Pinel, and Grand-Case, this last site also outside of the Réserve. The data is under evaluation, but the divers reported the return of sponges, which were heavily impacted by hurricane Irma. They also noted an excessive presence of dead coral colonies, also due to Irma. On the other hand they observed green algae, as well as the return of young macro-algae, which had drastically regressed due to the effects of successive swells. These algae compete for space and light with the coral, and clearly benefitted from the wastewater thrown into the sea. Under the aegis of joint underwater projects between reserves, Julien Chalifour went to lend a hand in Saint Barth in an identical context, but this time for the reef stations at Boeuf islet and near Colombier. He also participated in the implantation of a new plantbed station in Petit-Cul-de-Sac, since the historic station in Marigot Bay disappeared due to private cutting of vegetation, which provoked soil leaching and subsequently the suffocation of plant beds. Participation in a study organized by the Réserve of Petite Terre in Guadeloupe followed shortly thereafter. A sea turtle ready to lay her eggs has a window of just three days to do so successfully. After this time frame, and considering that she is capable of nesting several times in the same season, she must dispose of her eggs in the ocean to make room for the next eggs that are forming. Sea turtles only lay eggs every two or three years, but are capable of making nests three to eight times in the same season, with an average of 60 to 120 eggs each time. But only one in 1000 baby sea turtles ever reaches adulthood, 20 to 25 years after hatching. The others often fall to predators, or are victims of accidents, pollution, fishing boats, or poachers. It is now time to think about replanting the mangroves, which requires an agreement between ACED, the Conservatoire du Littoral and the Réserve Naturelle. After the cleanup and management by the Conservatoire, the Réserve Naturelle will take over. The ACED agents will dedicate the first six months of 2019 to the creative of a mangrove nursery, and the planting of trees in the impacted areas. Before this next step, they will benefit from theoretical and practical training led by Aude Berger and Anne-Marie Bouillé, who will teach them about the ecology of wetlands, the ecosystems of the mangroves and the ponds, as well as the role of environmental professions, especially that of a coastal warden. It took 141,000 euros to complete the clean-up of the Conservatoire’s sites, With the monies coming from the French Agency for Biodiversity, the Collectivité from government funds, and the Conservatoire du Littoral. The taking of aerial photographs with the help of a drone preceded this vast ecological restoration project, in particular above the salt ponds in order to indentify the damage to the mangroves, verify the state of the outlets, and pinpoint the debris in the most inaccessible areas. After that step, ecologist Mélanie Haerteman and Anne-Marie Bouillé, head of the Conservatoire in Saint Martin, did a study of the ponds: hydrologic measures (temperature, oxygenation, salinity, currents), and checked the health of the flora and fauna, as well as mapping the debris. A list of recommendations was created, with priorities for each site, actions to avoid and those to promote. In order to complete the funding request that was presented to the French Agency for Biodiversity last year, some ecological engineering work will be done in the next few weeks at he Etang de la Barrière, with the creation of channels to increase the flow of water at part of the site, as well as the clearing of the hydraulic connections between the Salines d’Orient and the Etang aux Poissons. Created in 2012 in the Marquises from the imagination of elementary school students, the concept of an “educative marine area” (AME) has been developed successfully across the French islands. In Saint Martin, three classes manage their marine area and were awarded the “educative marine area” label on June 4, 2018. This label, awarded by the French Agency for Biodiversity (AFB), recognizes the creation of an ecological project that invites students to think about the management and protection of natural marine heritage. These “junior rangers” become interested in a sector of their natural heritage and invest themselves in its protection and management. For example, a CM1 class at the Clair Saint-Maximim School alternates classroom study and field visits at Galion, under the watchful eye of their guide, Vincent Oliva, who is in charge of environmental education for the Réserve Naturelle. At the same time, two sixth grade classes at the Collège Mont des Accords have taken an interest in the littoral at Galisbay, with Amandine Vaslet, from the association “My School, My Whale.” The idea for all of these students is to define priorities for the protection of biodiversity at the site for which they are responsible, and apply their scholastic program to real-world examples, such as the replanting of the mangroves. The twinning of these classes is planned. The impact of hurricane Irma on the environment incited the French Agency for Biodiversity to call for projects that would restore biodiversity throughout the overseas territories. The Réserve responded to this call by submitting three dossiers. One of these projects, which has already been accepted, aims to finance the realization of a scientific inventory of the imparct of Irma on the flora on the small islands within the Réserve Naturelle—Pinel, Petite Clé, Caye Verte, and Tintamare—and the goal is to propose projects to restore the species and their habitants. A second project, not yet validated, concerns activities for the conservation of sea turtles and their protection. The objective it to continue the scientific study during the egg-laying season, as well as to develop the networks for marine mammals, to rehabilitate their essential habitats, which are the beaches where they lay eggs and the zones where they feed, and to reinforce public awareness programs. A third dossier, submitted by Vincent Oliva, seeks financing for the acquisition of awareness materials that can be used in schools. The technical division and nature police for the Réserve Naturelle carried out 259 patrols during the first nine months of 2018: 192 patrols on land and 67 at sea. Of these 259 patrols, 46 of them—or 29 on land and 17 at sea—resulted in warnings and eventually the seizing of material. These infractions include debris deposited in the Réserve, drones flying without authorization, stealing sand from Galion, boats mooring in places where it is forbidden to drop an anchor, use of jet skis, kite surfing outside of the zone authorized at Galion, and 11 fishing incidents in the Réserve: trap fishing at Galion, crab fishing in the salt ponds, fishing with a kayak on the Salines d’Orient, fishing with rods at Galion. At the same time, a quad user was informed that his motorized vehicle is not authorized on the roads within the Réserve and never on the beach.